A dual-purpose 400cc utility ATV built for both work and recreation, It has the world-renowned McPherson suspension that will support you on the most treacherous terrains. It has a strong water cooled engine and just a ton of power you'll love. Rock and roll in style and have everyone asking you where you got this awesome quad! Feel the wind in your face with the increased acceleration and jaw-dropping style. This is sure to become a best seller in record time, order yours today and we will have it in your driveway in 5 to 10 business days depending on shipping distances. This utility ATV will reach speeds of 50+ Mph and is not intended for youth under the age of 16 years. 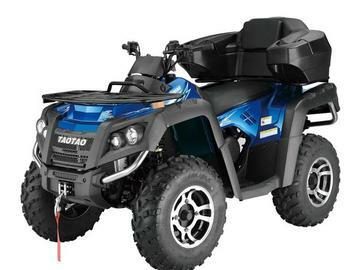 It's a rugged and dependable off-road workhorse, or an exhilarating sports recreational ATV. BE A RESPONSIBLE RIDER! FOR SAFETY, READ YOUR OWNER'S MANUAL. ALWAYS WEAR A HELMET, EYE PROTECTION, AND PROTECTIVE CLOTHING! NEVER RIDE UNDER THE INFLUENCE OF DRUGS OR ALCOHOL! ATV's - Parents consider your youngster's age, size, ability, and maturity before allowing them to ride. GO KARTS, GO CARTS, DUNE BUGGIES, ATV'S 4 WHEELERS, QUADS - Never ride on paved streets or public roads, and never carry passengers on your unit unless equipped to do so. Never engage in stunt driving or ride at excessive speeds. Be careful on difficult terrain. Riders under 16 years of age must be supervised by an adult. CountyImports.com recommends that ALL riders take a training course. For more information visit the ASI website www.safety.org. We have a put together a great collection of actual course study information, videos, and guides. You can have your children watch our ATV and four wheeler safety videos anytime for free! Not just in stock but viewable online! We know there is so much more to just buying a wholesale ATV, go kart or four wheeler. As a veteran dealer with over 5 years of online shipping experience, we have built our company with a stable foundation. Carrying parts and the ability to easily find what you need is more important than just the initial sale! With that statement, we naturally are willing to back up our comments with a fully functional, automated and user-friendly department just for you the customer! So, when it's time for your first service and if you ever need anything from a spark plug to the tire. We've got you covered. With over 60,000 parts in stock at the click of a mouse you are rest assured when you need it, we've got it! You have nothing else to worry about! The shipping carrier, UPS Freight, Fedex National, SAIA or any other carrier we use will call you 1-2 days before delivery to arrange a "block time" for delivery to ensure you are present for delivery. Please watch your phone and e-mail carefully 5+ days from the date of order. These go-karts and ATV's are specially designed and manufactured to be sold online. They have special packaging (minimize shipping damage and missing parts), every bike is tested at the factory (real test ride, not just started) Standard FREE Shipping takes anywhere from 5-15 business days depending on your location. We do offer other custom shipping methods during checkout. Express shipping, gift receipt, and business delivery are also options we offer! The continuously variable torque converter transmission always provides just the right amount of power. The high torque of the 4-cycle engine provides more than enough power to climb just about any hill you will ever encounter. Carburetion is 15mm and CV with automatic choke. Also has Ignition CDI & Kickstart. The operation is extremely simple. Speed is controlled by the twist grip throttle. There is no clutch to operate as the drive system is completely automatic. This vehicle holds 1-3.5 gallon of gas and can be located in the specifications table above, giving your cycle a range of 70-115 miles, depending on rider weight and terrain.